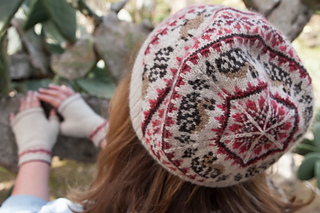 This fun, stranded slouch hat features adorable Ringtail Cat motifs and pretty flowers. The foldover brim ensures your ears will stay cozy warm. Purl stitches add texure. Duplicate stitch the eyes and ears for the second Ringtail cat section.